Have a question on Mohave? Mohave is available in 7 different colors - Clear White, Snow White Pearl, Platinium Graphite, Aurora Black Pearl, Silky Silver, Gravity Blue and Rich Espresso. Watch latest video reviews of KIA Mohave to know about its interiors, exteriors, performance, mileage and more. Kia Motors, the luxury division of the automobile giants Hyundai, has well established its niche in the automobile markets worldwide. 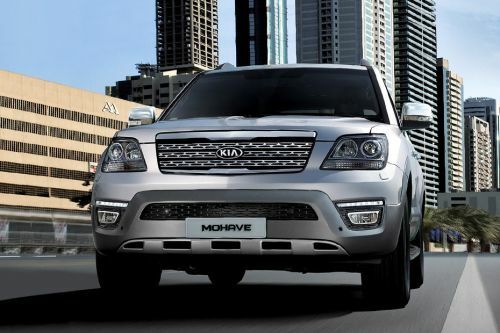 In 2008, the company came up with yet another sensational innovation named Kia Mohave. Also known as Kia Borrego, this SUV was designed by former chief automotive designer for Audi. Over the years, the car has received an overwhelming response globally and has been through its 'trough and crest' of success. As of October 2011, the car was discontinued with Sorento as its successor in many regions. Strong and purposeful image outside revealed by Kia Mohave states majestically equipped interiors. The driver's seat is lodged with comfort components like 10-way adjustment, Integrated Memory System (IMS) that automatically records last two driver seating positions-outside mirror-steering wheel and electronic and tilt steering wheel. Special rear seat air-conditioning and heater function keeps the inside ambiance as per your needs & requirement. You can keep yourself charged up listening to the favorite tracks via MP3, CD, DVD Player, USB, aux-in, iPod connectivity. Taking care of you to laden cargo in the boot space, it offers standard 350-litres of volume which can be further expanded on 3rd and 2nd row folding as per use. This mid-size SUV by Kia bespoke a strong and authoritative front profile embraced by the presence of large 'Kia' grille pattern in the front with company insignia emblemed in the centre. Moreover, the front bumper holds fog lamp housing at the corners and plastic cladding underneath gives the potent vehicle the rugged feat. Application of LED lamps in the rear increases visibility taking into account energy saving as the main motive. The car comes employed with elegant alloy wheels of size 17 inch and 18 inch that further adds to the sportiness. Mohave is quite a sturdy vehicle which is quite evident from its dimensions that measure 4880 mm x 1915 mm x 1765 mm (l x w x h) along with the wheelbase of 2895 mm. Kia Mohave comes equipped with two engine types – 3.8-litre gasoline engine and 3.0-litre CRDi diesel engine, both of which are capable of delivering robust and fuel efficient results. Depending upon your preference and driving methodology, you can select from either of the engines. The 3.8 litre gasoline engine gives a maximum power output of 274 PS at 6000 rpm along with a high torque of 361 Nm at 4400 rpm. Whereas, 3.0L churns out power of 255 PS at 3800 rpm alongwith the humongous peak torque of 549 Nm at 2000 rpm. Mated with responsive 5-speed automatic transmission, 3.8 litre engine can accelerate from 0-100 km/hr in 9 seconds clocking a top speed of 200 km/h. With the 3.0 litre diesel engine, this car can deliver mileage figure of 10.8 l/100km in combined driving cycle which is satisfactory. Empowered with good braking & handling system, it won't be difficult for you to built-in trust with this SUV. Front and rear wheels are employed with disc brakes. Alongside works BAS (Braking Assist), four-wheel drive system and rear electronic control air suspension. Double wishbone front suspension coupled with multi-link rear suspension provides stability and firm agility in off-road on-road streets. Maneuvering the vehicle in tight spaces is easy through front-rear parking sensors and 3.3-inch LCD rear display room monitor. Other safety aspects associated with this big-vehicle are auto light control system, side & curtain front airbags, downhill brake control, hill-start assist control, Electronic Stability Control and more. Kia Mohave may not be the most appealing SUV, but those looking for a traditional sturdy SUV embedded with efficient driving and handling controls, this SUV is a good buy. What is the price of KIA Mohave? On road prices of KIA Mohave in starts from AED108,000 for base variant 3.8L Base, while the top spec variant 3.8L Top costs at AED137,500 . What are the colors options available in KIA Mohave?